Your score determines your position in the search ranking of the 2PS platform, on clients and on experts sides. Members at the top of the ranking are supported by 2PS through conferences, articles, videos, social networks etc. They have a better chance to be chosen by their League manager or by other consultants, via "My league". A better score also means special promotions or discounts on your member account. Your score is based on two types of points: experience and sharing points. So, how do you get more points? The best and quickest way to win points. The 5% network fees support the 2PS network and its activities. Your League manager and your Regional manager receive a share of the network fees due on every amount you will report or invoice. 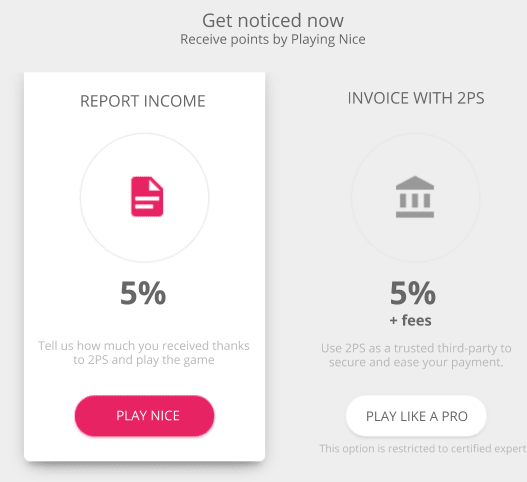 In the "Play Nice" menu, select "Earn points" to report income you did thanks to 2PS, or to bill through the 2PS invoicing system. When a client pays an invoice you've sent through the 2PS invoicing system, or when you pay the network fees related to an income statement, it gives you a corresponding number of skill points. If you want to reward another member for this amount (i.e. you've enjoyed working together or you've found this client thanks to an introduction), you can add his/her name in the "Play Nice" section. The corresponding number of sharing points will be given -this time- to the expert you named. In short, you receive skills points and your fellow member receive sharing points. The number of points you get when you pay network fees depends on your area. Check the points table to know your local rate. Skill point or sharing point? The rule is simple: sharing points are obtained by taking actions in the interest of others - skills points are obtained by concretely demonstrating your professional expertise. Serve a client to get skills points. Refer clients to other experts to get sharing points. Contributing to the 2PS community success. As mentioned above, referring a client to another consultant is the best way to quickly get sharing points. But it is not the only one. Attending 2PS events, co-writing an article or co-hosting a conference during a 2PShow gives you bonus points. 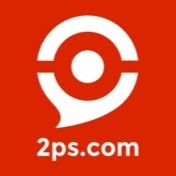 2PS encourages pro-social actions and gives you points to reward positive behaviors. For each area where there is a League manager, an exclusive Facebook group has been created. If you haven't joined already do so either by searching and applying or asking your League manager to add you. Occasionally, 2PS will offer additional points for a certain action for a limited period of time. This information will be published in the secret group for your region. to promote most successful members through conferences, articles, videos, interviews, eBooks etc. This table lists all the possible actions you can perform and what point amount you earn for successfully performing the action.